President Obama announces the launch of the Smart Manufacturing Innovation to be headquartered in Los Angeles. President Barack Obama announced a $70 million federal award Monday to a nonprofit co-founded by UCLA to create a nationwide Smart Manufacturing Innovation Institute, with the goal of improving the efficiency of advanced manufacturing. The institute will be headquartered in downtown Los Angeles in partnership with the city, led by the Smart Manufacturing Leadership Coalition and supported by UCLA’s leadership. It will include a national network of five regional manufacturing centers funded by $70 million from the U.S. Department of Energy and more than $70 million in matching funds from many of the institute partners. 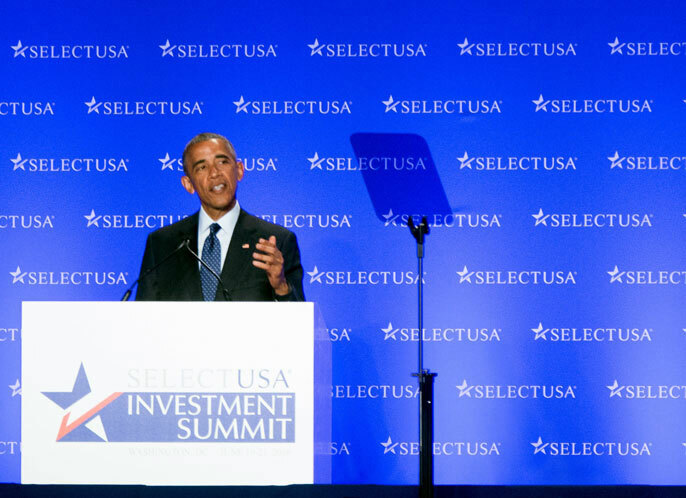 Obama announced the new institute at the annual SelectUSA Summit held today in Washington D.C.
UCLA Vice Provost of Information Technology Jim Davis will serve as the interim executive director of the institute, and UCLA will lead the California regional center with partners such as the California Manufacturing Technology Consultants, UC Berkeley and UC Irvine. The institute includes more than 200 partners from the Smart Manufacturing Leadership Coalition, which UCLA co-founded in 2006. Partners from more than 30 states include representatives from academia and government, as well as dozens of industry partners, including Google, Microsoft and Northrop Grumman. The new Smart Manufacturing Innovation Institute seeks to fuel industry growth in L.A., California and across the nation, using more than $140 million in public-private investments to develop advanced manufacturing technology and support a workforce and education pipeline. “As a critical proposal partner, UCLA has been instrumental in leading the way in smart manufacturing developments and research and ensuring community involvement,” Davis said. Information technology has transformed industries like banking, health care, entertainment and transportation, but manufacturing has not yet taken advantage of the ways information technology, sensors, analytics and controls can transform the industry, Davis said. With manufacturing using roughly one-third of the nation’s energy, the institute and its headquarters will focus on bringing together untapped opportunities in manufacturing performance, next-generation information technology and the adoption of advanced technologies to impact energy efficiency, Davis said. The Smart Manufacturing Innovation Institute is the ninth manufacturing hub awarded by the Obama administration. Existing hubs have begun creating next-generation semiconductors, lightweight metals for vehicles that are improving fuel efficiency, the first FDA-approved 3-D-printed medical device, and hundreds of jobs. The new institute will focus on accelerating the development and adoption of advanced sensors, data analytics and controls in manufacturing, while halving the cost of these technologies and radically improving the efficiency of U.S. manufacturing. The five networked regional centers will link California, Washington, New York, North Carolina and Texas, and the Los Angeles headquarters is the “ideal place to build the future of advanced manufacturing,” said L.A. Mayor Eric Garcetti. California is home to the largest manufacturing base in the United States, made up mainly of 40,000 small and medium-sized firms, and 1.3 million manufacturing employees. The institute will provide cutting-edge education and workforce training for high-skilled occupations to enable innovation, secure an underrepresented and diverse talent pipeline, improve the business climate and advance cross-sector collaboration. The California governor’s office has been a key champion of the coalition, and their support and resources were instrumental in the selection of Los Angeles as the headquarters for the institute, Davis said. The organization LA n Sync, part of the Annenberg Foundation and a member of the institute, was a key partner in engaging the business community around this manufacturing opportunity, Davis added. Partners also include: LA n Sync, Jet Propulsion Laboratory, California Manufacturing Technology Consultants, Cal State University Northridge, Lawrence Berkeley National Lab, San Diego Super Computing, UC Berkeley and UC Irvine, University of Southern California and others.